After now 2 years of accusations and constant headlines regarding allegations of still unproven “Russian influence” in the 2016 US presidential election, it is difficult to imagine that real political meddling or election interference anywhere around the globe could go unnoticed. This is especially true regarding the Western corporate media who has portrayed itself as deeply aware of the unethical and undemocratic nature of one nation interfering in the elections of another. Yet during Malaysia’s recent general election – hailed by the Western media as a “historic win” for an opposition the Western media clearly favored – not a single story was written by media organizations like Reuters, AFP, CNN, the BBC and many others covering foreign interference during the elections. Despite the lack of Western attention regarding foreign election meddling, it is revealed that Malaysia’s opposition is almost entirely comprised of US government-funded fronts – ranging from opposition leaders themselves, to political street fronts and organizers, to media organizations posing as “independent” Malaysian journalists, and “rights advocates” leveraging human rights advocacy to support the opposition and compromise Malaysia’s Barisan Nasional (BN) party. Malaysia – a former British colony – faces the incremental expansion of US and European “soft power” within its borders – transforming it from a sovereign nation into a subordinate, modern Western client state. As the US is attempting to do all throughout Southeast Asia from Cambodia to Thailand and the Philippines to Myanmar – the final goal is surrounding China with nations hostile to it politically, economically, and even militarily. Malaysia’s victorious opposition party – Pakatan Harapan (Alliance of Hope) – is openly headed by “de facto leader” Anwar Ibrahim. His service to Western institutions and the corporate-financier interests that created them – including NED – explains the unanimous support he has received for years throughout the entirety of the Western corporate media. Before his imprisonment in 2015, he led the Bersih street front, a movement Western media sources like the Guardian cited as being pivotal to unseating the ruling BN party. 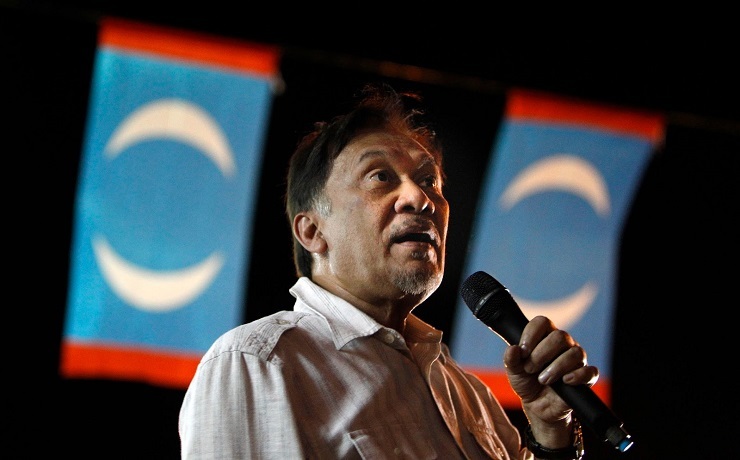 Elections are expected to be called any time in the next nine months, and even those who do not openly back Anwar often support what he stands for: relief from an autocratic and out-of-touch government they say has ruled Malaysia for too long. In April many tens of thousands of Malaysians took to the nation’s streets to demand electoral reform at rallies organised by Bersih, an opposition-backed coalition of civil-society groups whose name means “clean” in Malay. The above mentioned Ambiga Sreenevasan – who has played a key role in this year’s general elections in Malaysia – has received extensive US government funding for her activities, including US State Department money from NED subsidiary, the National Democratic Institute (NDI), provided for training and support for Bersih specifically. In other words, the US State Department worked with Malaysia’s opposition to build up its support base in an obvious effort to influence elections in their favor. NED’s official website often erases, deletes, and replaces financial disclosures regarding its political and election meddling around the globe. During the recent Malaysian elections, its disclosure for activities in Malaysia was coincidentally offline and instead, an ambiguous “search” page was offered. However, NED’s activities in Malaysia are extensive – ranging from direct support for opposition parties as illustrated through its support of Bersih, to the funding of pro-opposition media fronts, legal firms dedicated to protecting opposition members and targeting BN politicians, and fronts posing as “human rights” advocates. To promote good governance and accountability and to combat corruption. This multifaceted project will encourage public participation in efforts to combat corruption, including research on various forms on corruption in Malaysia; education around the Auditor General’s reports on the national budget; advocacy focused on strengthening the independence of public institutions; training workshops for youth on various aspects of corruption; and the promotion of online tools to build public participation in promoting transparency. To promote transparency and accountability within the Malaysian government and strengthen institutions working on issues of corruption. The organization will publish a series of articles, opinion pieces, and a book focused on efforts to combat corruption, produce infographics, and conduct roundtables and on proposed reforms designed to strengthen institutions and promote civic education on anti-corruption and good governance. To support a community of lawyers dedicated to the advancement of human rights through strategic litigation. The primary focus of the project will be the litigation of a variety of cases with important human rights implications and the conducting of public information campaigns and empowerment trainings. To promote open, reflective, and meaningful conversations among youth on diversity and inclusion in Malaysia. The organization will seek to promote an appreciation for pluralism through interactions between Malaysian young people and marginalized communities, including representatives of indigenous populations, refugees, and members of the Shia community. To carry out independent, objective public opinion research that will enable policy makers and civil society representatives to formulate policies and programs. The grantee will conduct public opinion surveys across peninsular Malaysia and Sabah and Sarawak to gauge the Malaysian public’s opinion on a variety of public policy issues. To provide the Malaysian public, especially young Malaysians, with a forum to discuss critical political issues in the country and to support the advancement of human rights through strategic litigation. Project activities will include a series of initiatives designed to improve young people’s human rights advocacy skills and encourage their involvement in political processes, support for a variety of legal cases with important human rights implications, and maintenance of a resource center for Malaysian youth. To strengthen political parties’ ability to campaign and govern responsively and democratically. The institute will bolster the skills of political parties in the areas of coalition operations, citizen-responsive and data-driven platform and policy formulation, messaging, and leveraging new media. It will also help to bridge the gap between parties and citizens by providing youth with the platforms and skills necessary to voice concerns and engage in discourse on issues related to Malaysia’s democratic development. And while the US State Department NED website lists an extensive amount of meddling in Malaysia’s internal politics, legal system, elections, and media – there are actually many more organizations it has failed to disclose. This includes the prominent pro-opposition “independent” media organization, Malaysiakini. Under its donors page, it lists Asia Foundation, Canadian International Development Agency, Free Voice, Dutch Embassy in Malaysia, Freidrich Naumann Foundation, International Centre for Journalists, Media Development Loan Fund (MDIF), NED, and George Soros’ Open Society as financial sponsors. It claims that it accepts no more than 10% from any of the 9 foreign government and corporate foundation sponsors that fund it. However, it is clear that all 9 of the listed foreign organizations funding Malaysiakini are themselves a combine of Western corporate-financier interests. Asia Foundation is funded by banks, weapons manufacturers, and big-oil. It also funded by the US State Department itself. MDIF is funded by Soros’ Open Society. The International Centre for Journalists runs programs funded by Goldman Sachs, Deutsche Bank, and chemical giant BASF. Thus, regardless of Malaysiakini’s attempts to divide up its sponsors to claim it is “independent,” at least 90% of its funding comes from US-European corporate-financier interests. Malaysiakini – like all NED fund recipients – undermines their own credibility by claiming corporations like Boeing, Chevron, Goldman Sachs, and BASF are interested in “promoting democracy” and “free speech” and not simply spreading their corporate monopolies into developing nations under the guise of both. While the Western media has depicted a small number of Facebook ads from a nebulous Russian-based organization operating on a budget literally a thousand times smaller than 2016 US presidential election campaign budgets, as “Russian influence” – the US State Department is spending millions of dollars on efforts in Malaysia alone to build up the opposition’s support base and swing elections in their favor. While the Western media clearly understands the unethical and undemocratic nature of such meddling as exemplified by their nonstop coverage of “Russian influence” since 2016 – they have failed categorically to even mention overt and extensive US meddling in Malaysia’s elections, let alone condemn it on equal terms with their accusations against Russia. US-funded agitators in neighboring nations across Southeast Asia enthusiastically celebrated the victory of the US-backed opposition in Malaysia. These groups, while claiming to fight for “democracy” in their respective nations – represent a pan-regional effort to impose US interests upon Asia. They often coordinate their campaigns, defend each other during their setbacks, and create synergies as they move their singular, foreign-sponsored agenda forward. This represents a risk to nations like Cambodia and Thailand where US meddling is also present and equally extensive. Protests in Thailand are funded by the US government and supported by US-funded media fronts and “rights” groups. The opposition party in Cambodia had gone as far as openly brag about conspiring with the US government to seize power. For Malaysia itself – it remains to be seen which direction the opposition will go. Policies that aim to confront China, provide the US with a foothold in a region it is being systematically evicted from, or assistance provided to militants operating in Thailand’s deep south will indicate a regime dominated by US-funded proxies, executing policy on behalf of Washington, not the Malaysian people. There is a possibility that the new government will include coalition members that keep its worst impulses in check. It is also possible that Malaysia’s ruling government will allow the opposition to absorb public anger for a certain period of time – as few of the opposition’s actual campaign promises are likely to improve the lives of average Malaysians – before taking power back in the near future. Either way, the notion of democracy is first and foremost defined as self-determination. If a political party or opposition movement is funded and directed by foreign interests, the nation they seek to control is no longer determining its own destiny, but having it determined for them by their foreign sponsors. This is why it is universally recognized as illegal, unethical, and undemocratic for one nation to meddle in the politics of another. For the US who has committed serial acts of international crime – including the invasion of Iraq in 2003, its current nearly two decade occupation of Afghanistan, its destruction of Libya and its ongoing proxy war in Syria – violating international norms and laws to meddle in another nation’s elections while accusing others of doing so to the US seems to indicate a partner genuine pro-democracy and pro-human rights advocates would avoid at all costs. Those embracing the US and its deep pockets cannot be trusted to honestly represent their true agenda and should be expected to camouflage it.